There are three main approaches to stopping the ball: with feet, body, or stick. Which method you use will depend on the game situation and placement of the ball. Whichever means you choose, it is important to remain focused on the ball¹s movement and to be aware of the players around you. In stopping the ball a player should be aiming to control the ball. Once control is established you can advance the ball via dribbling, a pass, or even take a shot. Being able to stop the ball is a vital skill and all three approaches should be practiced regularly! TIP: Whichever method you use keep your feet moving while awaiting the ball, it allows you to react more quickly to sudden changes in the balls path. Stopping with the feet: If the ball is on the ground (or even bouncing as shown above) a player can use their feet, keeping their heels (and knees) together. While it is technically within the rules to make a one-footed stop (ONLY if your foot is flat on the ground), relying on this method develops several bad habits. First of all the one-footed stop is less reliable (it¹s easy for the ball to skip over the foot), and secondly, the line between a legal one-footed stop and a kick is VERY thin! Make the effort to use both feet with the heels together and you will be rewarded by the results. TIP: Do not jump at the ball, but move into the ball¹s path ­ think about getting the ball¹s way. Try not to leap when stopping the ball, but rather slide into position. This will help prevent kicking or jumping over the ball and also allow you to adjust to any last minute changes in the ball's path. Stopping with the body/chest: A player may stop the ball with their torso. This can be an excellent way to control a sharply struck ball, especially if you can relax and absorb the impact so that the ball falls within your reach. Be sure to keep both hands on your caman as this will help maintain a concave arc across the front of your body as well as minimizing the chances of accidentally handing the ball. 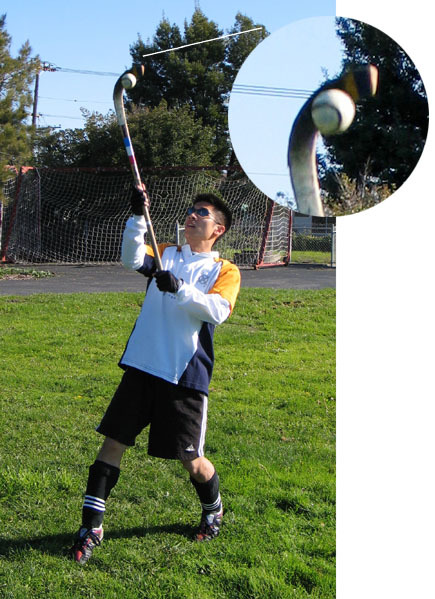 Additionally, by turning the torso to one side or another you can direct the ball to drop to a particular side. 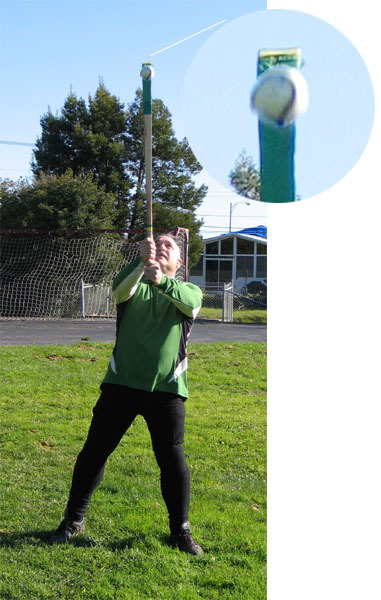 Stopping the ball with the caman/stick: When the ball is outside the immediate area of your body using your caman is the best way to make a stop. 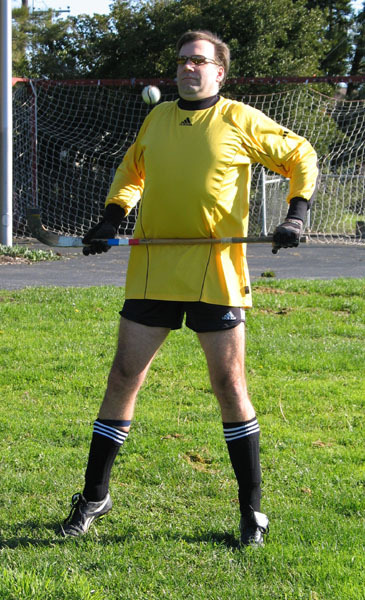 Balls in the air can be stopped with the back (flat) of the caman (above left, this technique is often used by goal keepers), or with the side of the blade (above right, be sure to angle the sticks towards the ground or the ball with pop-up into the air!). In either case it is best to line up your body with the flight of the ball, as this gives you the best view of the ball¹s trajectory. A loose (but controlled) grip will help absorb the impact of the ball and keep it from bouncing out of your reach. NOTE: While you would very often hope to control a ball taken down with the stick it is also possible to deflect the ball towards a teammate. Try to think where you are wwanting to drop the ball, keeping it away from defenders, moving it towards a teammate, or putting it close enough to control yourself. 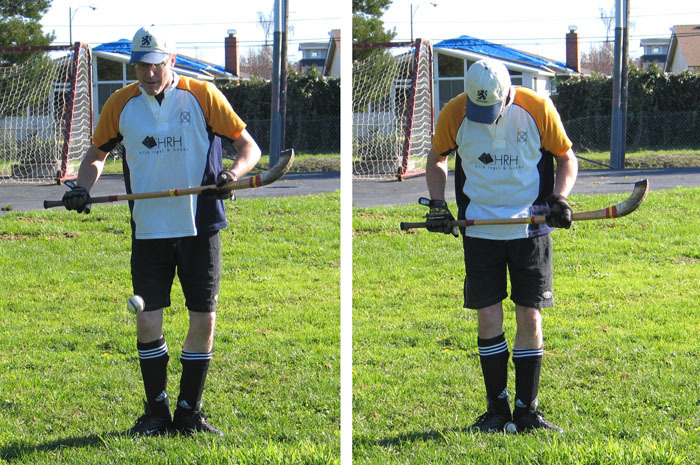 TIP: When stopping balls on the ground with the caman, it can be helpful to angle the stick so that the broad side of the blade/head is perpendicular to the ground ­ this keeps the ball from simply rolling up and over the angled head.